Yessir – this one is one of our favorites! Our etoufee is slowly simmered with a dark roux that brings out the richness of the flavors, then served over our famous dirty rice. The hardest part is choosing whether you want to add chicken, shrimp, or crawfish to your dish! We’d never make it as a Cajun restaurant if we didn’t make a killer gumbo! Ours is chock full of goodness with your choice of seafood or sausage and chicken, along with rice, okra, and other veggies that has been slow cooked longer than a tax refund check. Our Cajun Fried Chicken is extremely popular, with crispy deep fried goodness served over a bed of fluffy mashed potatoes and drenched in Andouille sausage gravy. It is also served with veggies on the side, but who has room to “eat their greens” when the chicken is this good?! P.S. it’s a generous helping, so come hungry! What’s better than fresh Gulf fish? Fresh Gulf fish stuffed with more seafood, that’s what! Each fish filet is stuffed with our shrimp and crab stuffin’, then drizzled in a creamy crawfish lemon butter sauce. Gator Tail is by far our most popular item on the menu! Served grilled over jambalaya with BBQ “ouch” sauce, it’s so good you’ll quickly realize why it’s a fan favorite. Never tried gator before? Get a smaller portion, fried and served with a little cocktail sauce - once you try it you’ll be back for more! These are just a few of our favorite Cajun comfort foods to warm you up this Fall and Winter season. 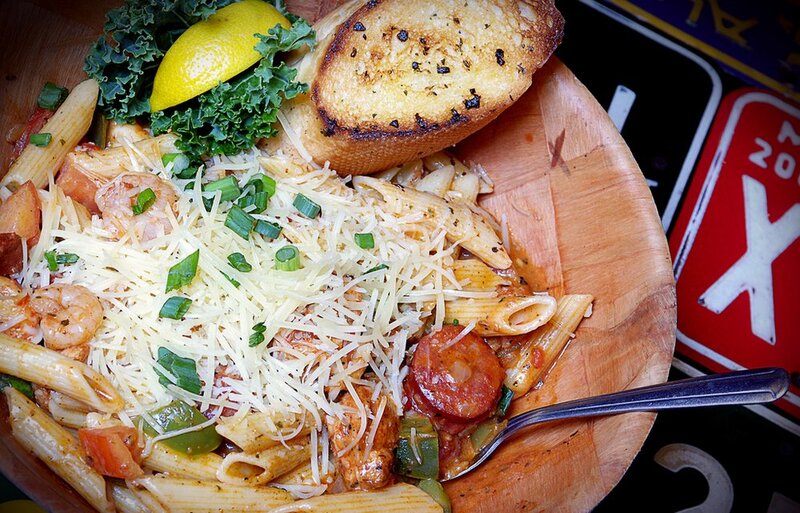 Join us at a Razzoo’s Cajun Café near you for lunch, dinner, drinks, and more. There’s a reason we’re the best Cajun restaurant in Texas!